A Chelsea-based client needed a bespoke wardrobe. 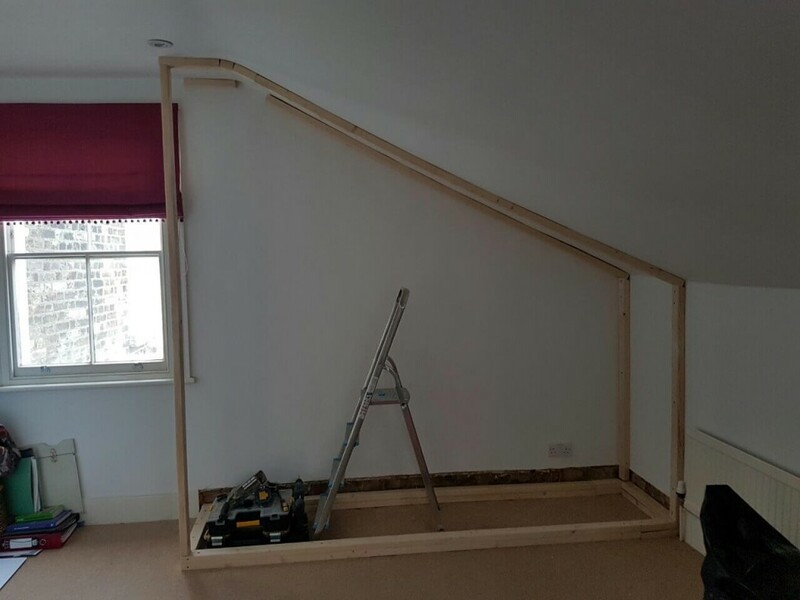 He wanted to utilise the space in the recess between the slanted ceiling and floor in an attic bedroom. In this specific case, the customised wardrobe was supposed to offer options to store shoes and clothes in a limited space. 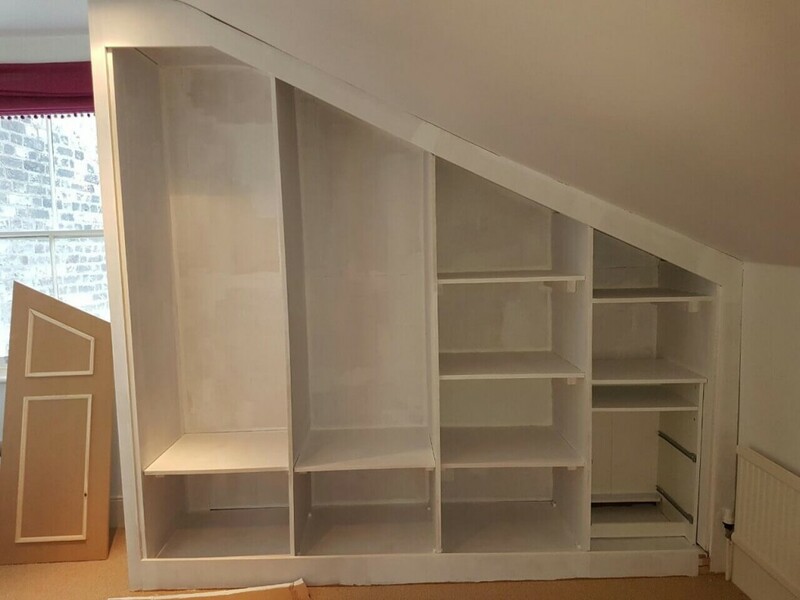 The Fantastic Handyman team was challenged to build a practical custom wardrobe, which offered extra space for organising while still adding a style to the room. A model of the finished wardrobe. The position of the new furniture in the room. The internal division of the sections and an example of how the wardrobe compartments would be best utilised. The team of professional carpenters managed to complete the project in a remarkable way. The goal was to create a practical design that remained as truthful as possible to the customer’s vision without sacrificing on the overall quality. Fortunately, the client simply fell in love with the proposed ideas and designs! 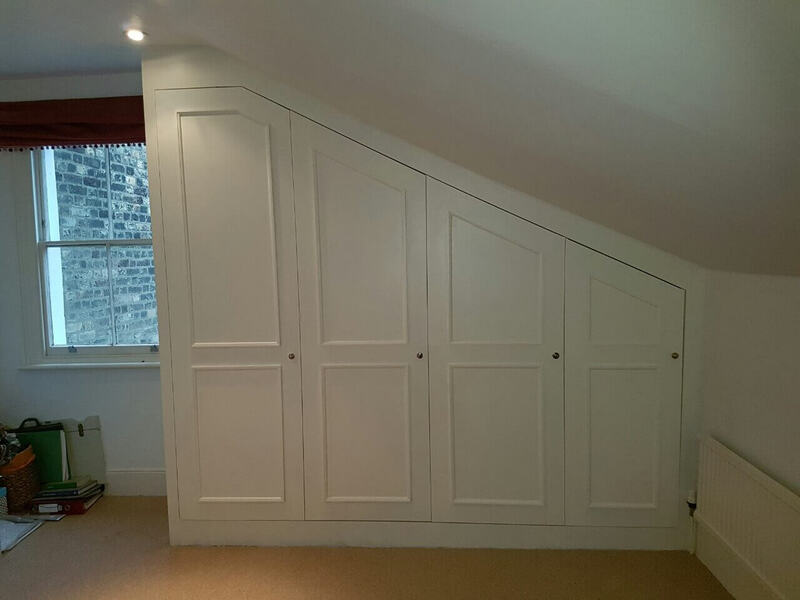 As part of the our bespoke furniture service, the materials for the wardrobe were sourced by the operatives from a local ironmongery in Chelsea. The recommendation of the Fantastic carpenters was to use MDF (medium-density fibreboard) - affordable, durable, and easy to shape, customise and paint. Just perfect for the case. Once on site, the handymen thoroughly took measurements and evaluated the dimensions of the space where the wardrobe was supposed to be fitted. The essential part of the work was ready to begin. The handy installers marked the areas where the holes had to be drilled in the wall and in the wood. The Fantastic technicians laid down hardwood joists, which served as the foundation for the wardrobe. Then, similar joists were fitted on the wall and on the ceiling in the room. 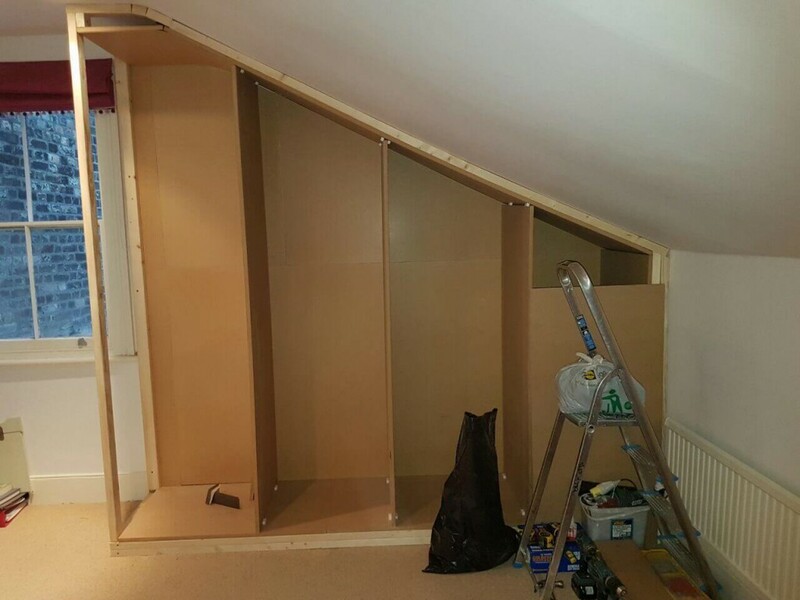 Finally, vertical stud posts were erected from the floor to the ceiling joist to create the structural frame of the wardrobe. The handymen nailed and glued the MDF boards to the studs. Several sheets of MDF were used to create the walls and the floor of the wardrobe, as well as the partitions of the different sections inside the wardrobe. The carpenters took care of the wood’s imperfections of the surface by applying putty to cover any holes and flaws in the MDF. The putty also helps even out rough and dented surfaces. The skilled craftsmen waited until the putty dried out and sanded down the wood afterwards. Time for some primer! They applied one coat of primer to the surface of the wardrobe. While the primer was drying out, the carpentry team didn’t rest! They started working on the doors. Measures were taken for the wardrobe doors. Then, the doors were cut out from the MDF material. Since the quality of our work is crucial for the whole presentation of the wardrobe, the team dedicated time to hide the imperfections of the wood treating it with putty and sanding it down. Eventually, a coat of primer was applied on the doors. After the primer dried out, additional 2 coats of paint were applied on the wooden surface, both on the walls and the doors of the furniture. The final step was to treat the wood on the visible parts of the wardrobe with gloss. Moving on to the assembly process. Hinges were installed and doors were mounted on them. Internal shelving and steel tube rails were also inserted. Eventually, the door knobs were fitted precisely to create the fully finished end product. 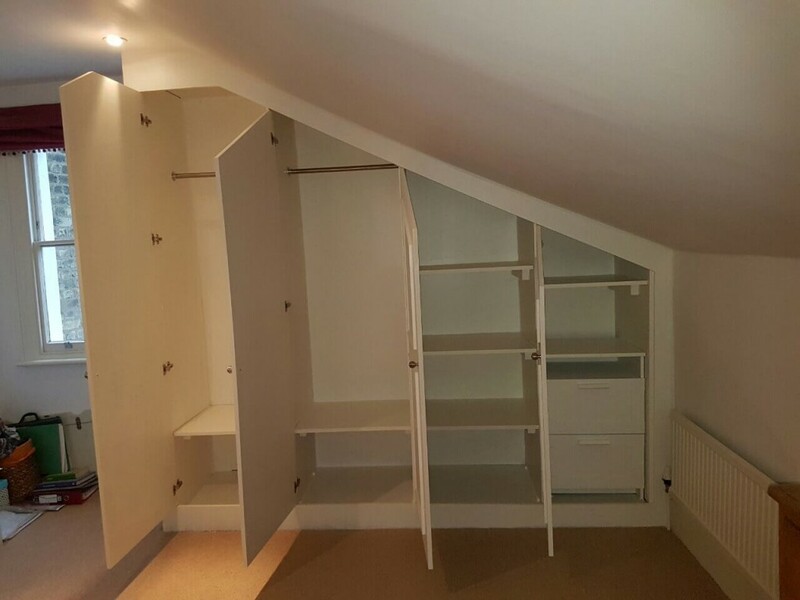 The client now has a beautiful custom-made wardrobe, which matches his tastes and needs, and has been done entirely according to the Fantastic Quality Standards of our handyman services! From start to finish, the Fantastic Handyman team was very timely & professional! The bespoke wardrobe you’ve made for me is awesome! Thank you so much! Ready to Order Bespoke Furniture?